Tender, juicy chicken, flavorful lamb and beef, crispy and delicious spanakopita. Fresh vegetables bought locally every day. Fresh grilled chicken, marinated overnight. A wonderful, healthy meal. Enjoy the freshness of it all! Our famous Avgolamono soup is made from scratch every day. 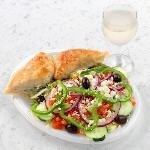 Mouth watering Spanakopita, a crispy spinach pie with a glass of Retsina. Mythos Grill (pronounced me-thos) restaurants are locally owned and operated, now with two locations serving Greensboro, NC since 2005. Mythos Grill is proud to import its own extra virgin olive oil, wine, cheeses, olives, herbs and spices directly from Greece. We are known for our fresh and healthy dishes, starting with our famous Chicken Souvlaki made from fresh, 100% all natural chicken bought locally every day and marinated overnight and cooked right when you order so it can come to your table tender and juicy. Our fresh Gyros, slow cooked in our rotisserie gyro machine, are full with flavors of Greek herb and spices. Pork Souvlaki is made exactly the same way that you will find in the streets of Athens. We prefer to cook our dishes with olive oil. You can't have our chicken, pork, or gyro without our own tzatziki (a combination of Greek yogurt, sour cream, cucumbers, olive oil, herbs and spices) Our crisp and delicious Spanakopita will melt in your mouth. 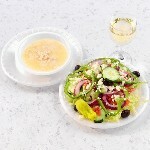 Our own Greek Dressing makes a perfect combination with the Greek Salad. It brings out the freshness of the veggies. After the first bite you will ask for more. Our famous Avgolemono Soup (or as we call it: Greek penicillin) is made from scratch every single day. All it takes is just one try and you will love it. 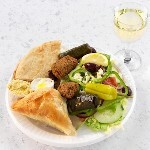 We also have Falafel, Dolmades, juicy Burgers and toasted Subs. We offer Spaghetti served several ways if you are in the mood for pasta. If you feel like being more adventurous with the Greek food, try our Moussaka and Pastitsio, both homemade from scratch. And yes, we cater. Don't cater your next party or business lunch with the same old foods that everyone expects. Call us today and learn more about how you can make your next event memorable with our Catering Services. Looking to treat someone special? 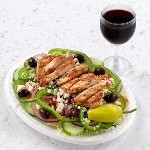 One of the best gifts you can offer is a healthy meal from Mythos Grill. Visit one of our locations to purchase a gift certificate. The lines will draw you in, the prices will keep you here, and the food makes you come back. If you are here, you are part of our family. Many studies and researchers have concluded that there are multiple health benefits of the Mediterranean diet and specifically that of the Crete region of Greece. Stop by one of the restaurants and pick up a gift card for the perfect gift.